Sharing is hard . . .
What reasonable man would like to be a city of demons? 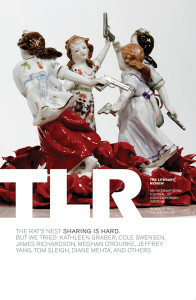 We decided last year, in a conversation of unprecedented unanimity, to dedicate an issue to the subject of collaboration and agreed, too, that it should be entitled “The Rat’s Nest” (just to reinforce how intimidated each of us—writers, loners, hermits, control freaks—are by the concept of working together). After which I spent a great deal of time sifting through relevant word associations. Collaboration, as in: artistic collaboration, underground political collaborators, snitches, love affairs, family dynamics, group think, multimedia projects, complicity, teamwork. In the two years before she died, my mother and I tried to write an opera together. She was a composer who’d spent most of her career writing perfect, complex, essentialist chamber music, as if rehearsing and fine-tuning her skills for the big explosive real projects she dreamed of. As if you needed forty years of practice to justify imposing your music on an entire orchestra, and a cast of mighty voices. I was an essayist and translator who loved music despite being tone deaf. We spent too long discussing what text to work off. I wanted to turn the Al Pacino movie Dog Day Afternoon into an opera; she wanted to set Melville’s The Confidence-Man. Not admitting perhaps how short our time together would be, we leisurely and at long last settled on a novella by Italo Calvino from Under the Jaguar Sun called Il re in ascolta that we both loved. The summer we sat down together to write, we were in my mother’s offbeat Italian studio in a remote, medieval Tuscan village. I sat at my desk, a rickety card table, in an alcove right above where she sat at her piano, a good quality electric that she liked to use with headphones. And we hollered back and forth at each other. Not since I was fifteen years old had we fought so fiercely about every single thing. I kept telling her how I thought the orchestration should sound, and she kept turning my sentences around and debating my interpretations of Calvino’s vision. I had one elaborate staging in mind that would have only worked in Salzburg’s Felsenreitschule theatre. She had another, so simple it could work in a university lecture hall—which was eventually where the small section we managed to finish debuted. The only thing, I discovered that summer, psychically harder than navigating a mother-daughter relationship was artistic collaboration. Yet I’d give my eyetooth to have had the wherewithal to finish it; or better even, to be still working on it today. Perhaps that’s the threat of collaboration, you have to survive to maintain it. Now that we have the completed collaboration issue in hand, and I can see again as a whole what’s been a puzzle of elements for so long, I realize that this rat’s nest has become an anthology of death. Which is, some say, the only thing that we do unequivocally alone. Our opening project is an exquisite corpse poem built on the old parlor game model (each poet sees only the single line of poetry directly before his). The fatal accident of Kevin Lutz’s “Giving Up the Ghost” spins a web of community around grief. There’s a perversely sublimated collaboration at the heart of Elahzar Rao’s murder mystery, “Saudade.” Poet Henry Israeli’s divorced parents are reunited six feet under. The wending melody of “Just So People” reveals an elegy. A dead son and wife haunt the Himalayas in “Footmarks.” Even our most sophisticated collaborative piece, “[Spoiler Alert],” had as its goal the eradication of unique authorship: killing the author. How did an endeavor that seemed to promise building together land us so squarely in the graveyard? My guess is that as artists, loners, control freaks, we’re even more terrified of collaboration than we thought. I know I am. Welcome to our rat’s nest. Just as collaboration has a strangely broad array of meanings—from laudable to punishable—so the picture on our cover requires several different takes to fully absorb it. From the first glance, though, I loved about “Ring-a-Ring o’ Roses”—the innocence and violence, the hand-holding cooperation, the sedition. I love the way the figurine in grand narrative tradition carries at least five or seven different time frames: the now of the guns. The antique then of the Victorian children. The retro kitsch then of mid-20th-century tchotchkes. The popular deep-history then of the game, ring around the rosie, said to be about the English Great Plague of 1665. The floating nostalgic then of innocent childhood. And the bitter rupture of innocence illustrated by the guns brandished by the figures. The now in which the artist, Barnaby Barford, puts it all together. This particular piece comes from a series that looks “at ideas of lost youth, gang violence, and perceptions of youth,” which, the English artist explains, was a response to the media frenzy around a period of youth violence in London. Barford says he “wanted to explore the boundaries between reality and hysteria.” And, like much of his work, the original figurines represented a “chocolate-box version of life” corrupted through the making process. The specificity of Barford’s small sculptures, mostly found objects reconfigured by the artist with a saw and paint, gives them wonderful scope. Barford’s work is at once wistful, funny, and scathing. It seems in so many ways to give a visual response to our own ambivalent interpretation of collaboration, both in art and in how we respond to the contingencies of daily life.